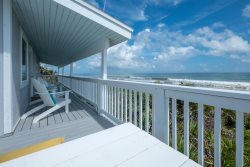 This must be the most perfect, cleanest and best maintained beach home in all South Ponte Vedra! This fantastic beach home sleeps as many as 22 guests in beds! * Note: For FULL details of sleeping arrangements please scroll down to "Disclosures" at the bottom of this page! "Oceanside Perfection" is the perfect home for family reunions, or grown siblings with children, who get together so the little cousins can meet and play, multiple generations or you name it. For any occasion this is THE perfect beach home! Book it today before your favorite dates are gone! Let’s take a tour: when you walk through the front door you enter the absolutely gorgeous foyer. From there you have two options, upstairs or downstairs. Going upstairs brings you to the heart of the home. Here you will find the beautifully remodeled main living areas. Downstairs brings you to the life of the party, the game and media rooms! First, the upstairs; check out all the windows and beach / ocean VIEWS!! The living room has a HUGE High Definition, 80-inch (not a typo, 80 inches!) television perfect for movie night, the family’s favorite TV show, or the big game! The living room also features plenty of seating to enjoy the views and good conversation with family and / or friends. You will be blown away by the newly re-done and fully equipped kitchen! You will definitely experience the finer things in life when you take in the beautiful granite countertops and backsplash. All of our appliances are brand new and stainless steel, for that modern sleek look. The coffee maker can make a full carafe or one cup of your favorite brew in under a minute, using Keurig style pods. Of course, our kitchen comes equipped with all of the plates, cups, silverware, and kitchen utensils you will need. A nice feature of the cabinets is that they are glass fronted,which means you don't have to open every cabinet to see what is in them. This is a real convenience when you are not familiar with where the dishes are placed, plus it's very attractive! Naturally, more fantastic views of the main attraction, "The Great Atlantic Ocean". The entire common areas have panoramic views! Enjoy the dining room table with direct ocean views; that is, if you don’t want to eat outside on the deck! The dining room table seats six, and for extra seating, the lovely granite breakfast bar has room for eight more. Speaking of the deck, it’s the perfect place to soak up some sun! We provide some lounge chairs where you can lay out and work on that tan! As mentioned before, there is an outdoor table for dining or relaxing with an umbrella for added shade. The master bedroom has direct deck access through sliding glass doors, with beautiful ocean views. There is nothing like waking up to a glorious sunrise over the ocean. Who wouldn't want to stretch out on the king-sized bed? It wouldn't be a master bedroom without another HUGE large flat screen tv too! The master bedroom also includes a huge en-suite bathroom. If you don’t feel like going all the way downstairs to do your laundry, no worries, there is a brand new LG top-loading washer and dryer in the master bedroom’s roomy walk-in closet. The master bedroom includes an extra-large walk-in shower with beautiful meticulous tile work. Stay warm all year long with our towel warmer too! The vanity has two sinks, so no having to take turns while brushing your teeth! Bedroom number 2 includes a queen-sized bed, large flat screen TV, and balcony access where you can take in a beautiful Florida sunset. There is also direct access to the hall bath, which boasts a sink, toilet, and shower stall. Bedroom number 3 is located on the second floor to the left when you’re coming up the steps and off of the kitchen. There you will find a lovely queen-sized bed and a flat screen TV. Going downstairs, the kids (adults too) will be blown away by the large game room, which features an air hockey table, arcade machine, and direct access to the deck. Naturally, you’ll have great views of the main attraction, the beach and ocean! When you have a home that accommodates 18 to 22 guests, you need plenty of bathrooms! This one doesn't disappoint. The first downstairs bathroom has a luxuriously large walk-in shower and is decked out in beautiful granite. The second downstairs bathroom features a shower/tub combo with a urinal AND a toilet. This bathroom also has beach access so that you can go from the beach to the shower! In the media room there is a huge sectional couch, projector, and screen. Note: The media system is not yet completely setup, however, it is scheduled to be completed soon! This room also doubles as a bedroom because it has two sets of built in, full-sized bunk beds, and each bed has its own flat screen TV and each bed has its own electric outlet with built in USB port! Off the media room is another small bedroom I call the kid’s room due to the two sets of twin-sized bunk beds with, of course, a TV on each level. Is there such a thing as too many TV’s? There are two more bedrooms downstairs. One bedroom has a king-sized bed AND ocean VIEWS! It is setup “Jack and Jill” style with a shared bathroom (with shower) between them. With three bathrooms downstairs plus the media/bonus room you never have to wait to take a shower! Also, conveniently located, another huge washer and dryer is located in the garage. By the way, the other washer and dryer is located upstairs between the master bedroom and master bathroom. Step out of the game room and you are immediately greeted with ocean views. The downstairs deck is mostly shaded and has a very lovely hot tub. The yard is perfect for sun bathing or a game with the kids! This amazing home features a multitude of electric outlets with almost all of the outlets also including USB ports. Can’t find the USB block for your phone or charger? No problem! You can plug your USB cord directly into the outlet to charge your devices! Then, of course is the main attraction, the amazing Atlantic Ocean! The sunrises are great and if you are lucky enough to be here for a full moonrise, it is an experience that you will never forget. The 5 traditional bedrooms sleeps 2 in each room for a total of 10 people. The media room downstairs has 4 built-in bunk beds, 2 up and 2 down, each a full-sized bed that can sleep 2 in each bed for a total of 8 people. NOTE: There is NO closet in the media room at this time, also the projector is not setup yet! ALSO: There is a fairly small bonus room just off the media room that has 2 twin sized bunk beds (2 up and 2 down). This room can sleep as many as 4 people (1 person per bed) This BONUS Room does NOT have a closet at this time. During peak period times, which include national holidays and the months of June through August, there will be a minimum saty of 7 nights. This will also include a Saturday check in and a Saturday check out. Please check your dates so that you can enjoy this wonderful home.